As of November 11, 2015, rebate incentives are no longer available for High Efficiency Toilets rated at 1.28 gallons per flush (gpf). Rebates are now available for Premium High Efficiency Toilets using 4-liters (1.06gpf) or less, and are offered at $40 per toilet. The largest amount of water used inside – 30% – goes toward flushing the toilet. But how much water your toilet actually needs to flush properly is less than you think! 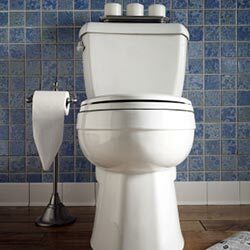 Replace your old toilets with premium high efficiency toilets that use just 1.06 gallons or less per flush. Premium high efficiency toilets use almost 20% less water than the WaterSense standard and flush the same amount of waste just as, if not more, effectively. Home improvement stores throughout Orange County carry rebate-eligible toilets. Residential Rebate Level: $40 (or more) per toilet. Commercial Rebate Level: $40 (or more) per toilet. A Commercial Premium High-Efficiency Toilet comes in two categories, either as a tank toilet or a flushometer toilet and uses only 1.1 gallons or less per flush, almost 20% less water than the current WaterSense standard. Eligible toilets must replace existing toilets using at least 1.6 gallons per flush.